Freshman forward Ajiri Ogemuno-Johnson scored a career-high 10 points against Norfolk State on Dec. 12. Although he was featured on ESPN and received multiple Division I scholarship offers, freshman forward Ajiroghene “Ajiri” Ogemuno-Johnson’s story had a humble beginning nearly 5,500 miles away in Nigeria. Ogemuno-Johnson’s first exposure to basketball came at age 13 when he transferred to a new middle school. The school eventually discontinued the basketball program because the children didn’t really understand how to play the sport and kicked the ball around like they were playing soccer, Nigeria’s most popular sport. Ogemuno-Johnson in 2013 on the court where he discovered basketball in Nigeria. But for Ogemuno-Johnson, he was too interested to give it up. One day, he returned to the court and approached two men that coached the children in basketball, while they practiced. Ogemuno-Johnson practicing in 2013 in Nigeria with his coach Nwabueze Chinaenyem. The players and their coach, who organized their weekly games, taught Ogemuno-Johnson the game’s fundamentals and he fell in love. There was one issue though, his father, Johnson Owhotemu, thought there was no future in basketball and feared it would interfere with his academics. It was too late though, Ogemuno-Johnson was already hooked. Despite being warned numerous times by his father, he continued to sneak off to the courts and return past his curfew. After multiple conversations about how school was more important than basketball, his father found a new way to communicate his disdain for the sport. In his youth, Johnson Owhotemu had to provide for his younger siblings and put them through school after his mother died, which taught him the importance of an education at a young age. He also showed Ogemuno-Johnson the statistics of how only a small percentage of athletes become professionals from Nigeria and that an education would take him further than basketball. When Johnson Owhotemu realized that being locked out of the house wasn’t enough of a deterrent, he refused to pay Ogemuno-Johnson’s tuition. This time Johnson Owhotemu’s tactics appeared to finally work. Ogemuno-Johnson told his parents he would give up basketball, but they underestimated how driven he was to play the sport. Once Johnson Owhotemu paid the tuition, Ogemuno-Johnson was back on the court the next day. Throughout the entire process, Ogemuno-Johnson’s mother, Beatrice Owhotemu, was always there for him. As he entered his freshman year of high school, Ogemuno-Johnson attended a camp hosted by AccessToSuccess, a Christian-based athletic and educational organization for Nigerian children. From there, Ogemuno-Johnson was invited to an Under-16 national tournament where he was approached about a potential move to the U.S. to pursue a basketball career. However, Ogemuno-Johnson already knew his parents would dismiss the idea. A representative from the organization told him they would handle his parents, but that process was much more difficult than the organization ever anticipated. No one in his family had ever seen Ogemuno-Johnson play basketball before and couldn’t fathom why he was given the opportunity. After Ogemuno-Johnson consulted with his older brother, Felix Ogemuno, who had the ability to influence his father, the family was able to convince Johnson Owhotemu to allow him to accept the offer and play in the U.S after a lawyer reviewed the papers to make sure they were official. Johnson Owhotemu was on board with the idea until it was time for Ogemuno-Johnson to get on his plane bound for the U.S, after a six-hour drive to the airport. 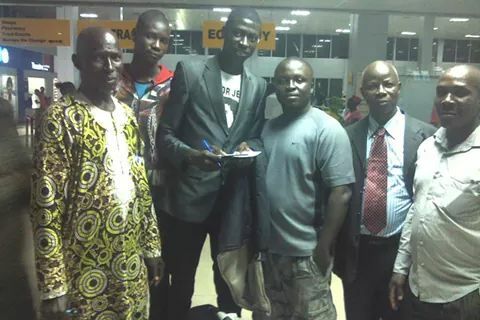 Ogemuno-Johnson (middle left) and Johnson Owhotemu (far left) at the airport along with his former coach, Nwabueze Chinaenyem, (middle right) before his flight to the U.S. Despite no exposure to basketball for the first 13 years of his life, being locked out of his house and kicked out of school, Ogemuno-Johnson’s love for basketball would not be denied. However, as he began the next chapter in his life, Ogemuno-Johnson had to endure more struggle along his journey to achieve his dream. After his initial happiness to be in the U.S., Ogemuno-Johnson struggled with the adjustment to a new culture, weather and environment. If all of that wasn’t bad enough for Ogemuno-Johnson, the man who was supposed to be his mentor when he arrived in Florida to attend school, Jeff Coverdale, was fired a week before he landed in the U.S. The school, Florida Air Academy, allowed him to stay there because he was already a month behind and had no one else in the country. But once the school cut scholarships for athletes after it transitioned from a military academy to a preparatory school the following year, he had to leave. Ogemuno-Johnson was introduced to Jeff Coverdale’s brother, Dwayne Coverdale, while he attended Florida Air Academy and played with the Amateur Athletic Union (AAU) team, Nike South Beach. Dwayne Coverdale also partnered with an AAU team in Philadelphia, Pennsylvania, We R1, and it was decided that Ogemuno-Johnson would transition to We R1 and move closer to Philadelphia, Pennsylvania so he was near Dwayne Coverdale. After he made the move, Ogemuno-Johnson spent his sophomore year at a preparatory school, Putnam Science Academy in Putnam, Connecticut before he transferred to Monsignor Bonner and Archbishop Prendergast Catholic High School in Drexel Hill, Pennsylvania. At Putnam Science Academy, Ogemuno-Johnson met a future Rider teammate, junior center Tyere Marshall, while the pair played together for one season. During his senior year at Monsignor Bonner and Archbishop Prendergast Catholic High School, Ogemuno-Johnson made it onto ESPN’s SportsCenter Top 10 as the No. 2 play with a game-winning dunk against St. Joseph’s Preparatory School. When it came time to decide where he would play collegiate basketball, Ogemuno-Johnson had a number of choices. According to VerbalCommits.com, Ogemuno-Johnson received offers from 13 schools including Delaware, Drexel, La Salle and Monmouth. Head Coach Kevin Baggett relied on his relationship with Jack Concannon, the former head coach at Monsignor Bonner and Archbishop Prendergast Catholic High School and Baggett’s teammate at St. Joseph’s University, to convince Ogemuno-Johnson that Rider was the right choice for him. In his freshman season, Baggett expected Ogemuno-Johnson’s role to be the backup center to his Putnam Science Academy teammate Marshall, but felt he had a bright future as a Bronc. Ogemuno-Johnson made his first collegiate start in place of Marshall on Dec. 12 in an 81-71 victory over Norfolk State. He posted career-highs in points, rebounds and blocks with 10, seven and four, respectively. Off the court, Ogemuno-Johnson, a business major with an art minor, likes to draw and paint in his free time. He started to draw as a child in Nigeria when his Sunday school teacher needed a volunteer. “I kind of had difficulties with basketball and coping with school, so I kind of used art as my getaway to really focus, think and create something I love,” said Ogemuno-Johnson. Ogemuno-Johnson’s biggest influences on his style of play are a pair of centers who also hail from Africa. Hakeem Olajuwon, who was also born in Nigeria, and Philadelphia 76ers superstar Joel Embiid, born in Cameroon, provided inspiration for Ogemuno-Johnson. While in Nigeria, Ogemuno-Johnson watched YouTube highlights of Olajuwon in an effort to perfect his post skills and videos of Washington Wizards center Dwight Howard to become a defensive presence at the rim. As for his goals on the court in his first season as a Bronc, Ogemuno-Johnson wanted to be an energy guy for his team and be a leader. He said that even as a freshman, he could lead through his work ethic. Ogemuno-Johnson (far left) and his teammates, freshman forward Tyrel Bladen (middle left), Marshall (middle right) and graduate student guard Anthony Durham (far right) show off their progress from offseason workouts. Although he hadn’t returned home since he left Nigeria, Ogemuno-Johnson’s heritage is extremely important to him. When he first came to the U.S., his peers couldn’t pronounce his last name, Ogemuno, so he decided to go by Johnson, his father’s English name. According to Ogemuno-Johnson, his last name means “My generation have come to stay” and when it was pronounced wrong, the meaning was being taken away. Prior to the start of his collegiate freshman season, Ogemuno-Johnson decided he needed to go back to his original name. With the passion and dedication he displayed to battle through every obstacle in his path over the last five years, someday soon people will learn his name. And maybe one day a child in Nigeria will watch his highlights on YouTube and be inspired to pick up a basketball.